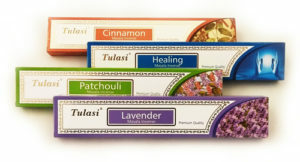 We have a variety of incense used for therapies, meditations or even ceremonies. Lavender: fragrance that is reminiscent of a million lavender flowers in Bloom. Calms the body and mind. Helps relieve stress. Vanilla: creates a beautiful fragrant atmosphere of vanilla and other natural herbs. Guidance with mental thoughts and intelligence. Cinnamon: Creates a spicy and delightful fragrance, balancing emotions. Healing: a mix of lavender and Gerenium, Vettivert, Tremoss. Warm and pleasant incense that touches your soul. Jasmine: emits a pure jasmine fragrance that is sensual and long lasting also associated with love and beauty. Dragon’s Blood: burned for love, strength and courage, a strong and diffusive fragrance that brings you a truly oriental experience. Sandalwood: emits pleasant and long lasting fragrance for purify or sanctify.